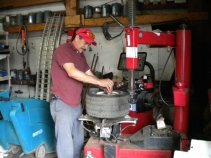 Consider buying used golf cart tires the next time you need to replace your tires. I was tired of constantly inflating my left rear tire and decided it was time to replace it. My cart has Duro golf cart tires and I just needed to replace one of them. 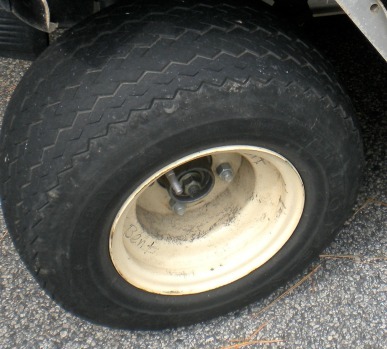 If you're looking for cheap golf cart tires - you might want to try getting some used ones. Here in Peachtree City where we have lots of golf cart businesses, it is possible to save some money by purchasing good, used tires instead of new ones. 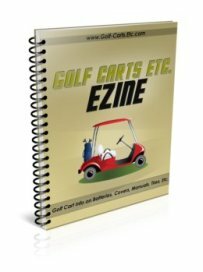 For instance at Affordable Golf Carts, where they have golf cart salvage parts, I can purchase used golf cart tires and for $25. I have a tire that keeps loosing air and I'm tired of keeping it pumped up, so it's time to replace it. 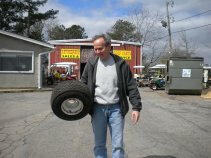 So I headed to Affordable Golf Carts to go to their golf cart salvage lot to take a look at some used tires. As you can see from the picture, there was a good selection of used golf cart tires - none of them were on the rim. So our friendly helper picked out a tire that didn't have much wear on the tread and then checked it for any air leaks. The first one had a leak, so back he went to pick out another good, used tire. The second tire checked out fine, so he put on the rim with this machine. I am happy with my purchase and ready to get this good, used tire on my golf cart. I saved $14 by buying a used tire. Although the tread doesn't match perfectly to my other tires, it is close enough. New golf cart tires and wheels range in price from $31 for a standard Saw Tooth wheel at Amazon (and not including the rim) to $46 at our local golf cart dealers. It is possible to purchase cheap golf cart tires on line. However, at this price the wheel or rim is not included. Buy golf cart wheels and tires assembled to save some money.